If you’re looking to win that unspoken neighborhood contest of “Best Halloween Decorations” then look no further! If you want to deck out your porch, there are a couple of things you can incorporate. As with everything, it’s important to pick a theme and stick with it. 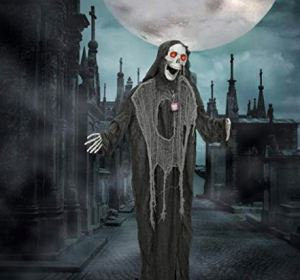 Whether you’re going for homespun, kid-assisted, or spooky, I’ve got what you need to make it look the best! If you’re looking to create a porch that is goofy and in the silly Halloween spirit, then look no further! 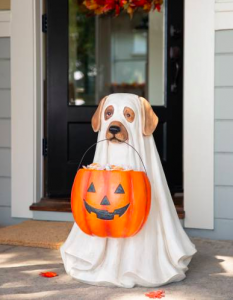 This pooch will be a fabulous center piece for any porch, and as a bonus it can hand out your candy for you. Get it here. 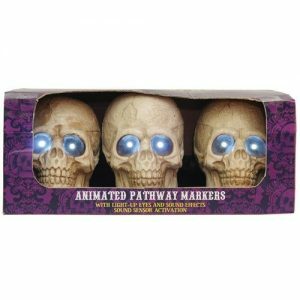 You can add to the Halloween fun by popping a few of these along the walkway. 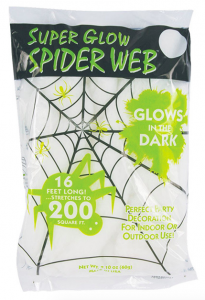 To add a little bit of spook, you can accessorize with glow in the dark spider webs over the porch. Get them here. To top off your goofy/funny porch, you’ve got to have something like this. Whether you wrap it around a tree or put her on your door-it will go perfectly with your silly dog! If you’re in the mood to be the scariest porch on the street, then there are some elements that are a must. 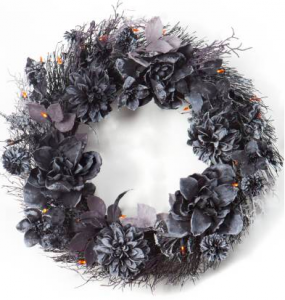 This wreath will help set the tone with black and orange and just a hint of mystery. 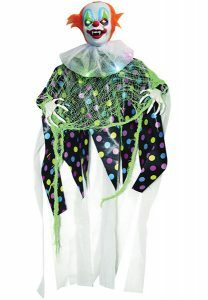 This scary light-up clown is sure to add spook to any porch. With his glowing eyes and long fangs, it’s sure to scare anyone. If you want something that is animated, then this is the one for you! 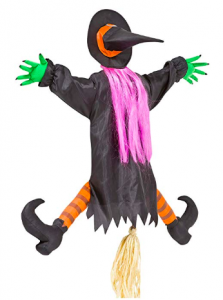 It will move, glow, and scare and unsuspecting kids! A corner stone of any scary porch is a fog machine. This helps to create a good atmosphere, hide any strings, and amplify the scare. This one is a great price and easy to use. 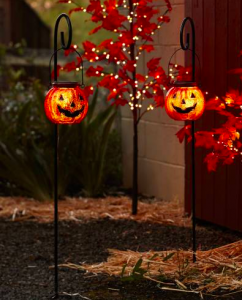 Combine it with flashing LED lights and you’ve got yourself one ghastly porch! 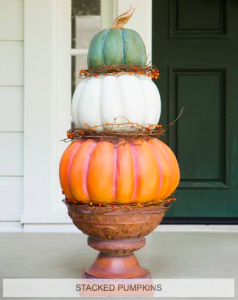 Lastly, adding a few of these on your walkway is a sure way to help set the tone of your porch. If traditional is more your style, then you’re going to want to forgo the smoke machine and kitschy stuff. Instead, focus on the major elements of the season: pumpkins and fall foliage. Stick to an autumn palette of orange, yellow, gold, with the occasional green accents. 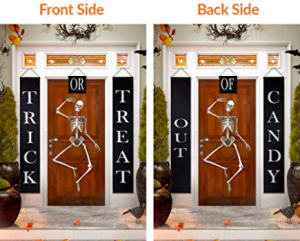 These make a great addition to the side of your door. Plus they will transition from Halloween to Thanksgiving pretty effortlessly. 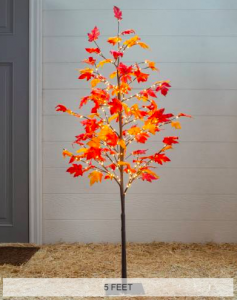 You can add some light by accessorizing with these awesome trees that come in 3′ and 5′. 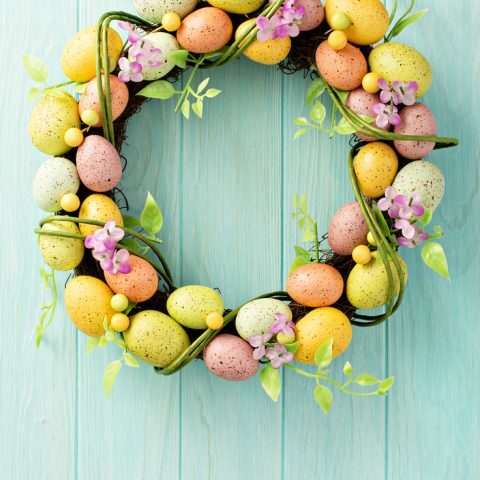 Adding in these darling signs that double as “Out of Candy” signs, are an awesome way to pay homage to the holiday without going all out. 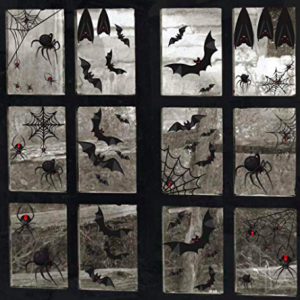 These window clings are another simple way to have a subtle nod to All Hallow’s Eve without breaking the bank. And there you have it! 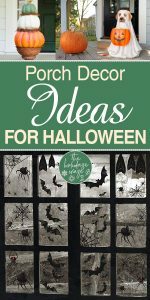 Three ways to decorate your porch to celebrate Halloween!